Ocean acidification cut the growth of a coral reef on Australia's Great Barrier Reef by one-third, according to a study published Wednesday in Nature. By simulating a more acidic environment, researchers were able to look at the effect of carbon dioxide on multiple reef species in their natural habitat for the first time. Why it matters: Hundreds of millions of people around the world rely on coral reefs — for food, income from tourism and protection from tsunamis and storms. The study suggests the combined impact of coral bleaching from increased water temperatures and ocean acidification from carbon dioxide emissions could impair a reef's ability to recover. "They’ll be hit by two stressors simultaneously so the effects could be worse than what we expected from lab studies...The bleaching events we see today that look scary could be even worse when compounded by a falling pH." How it works: Carbon dioxide from emissions dissolves in the ocean, lowering the pH of the water. More acidic water reduces the concentration of calcium carbonate that corals use to build reefs. Right now, the reduced rate of building is still fast enough to maintain a net gain despite loss from erosion and dissolution. The big question, Andreas Andersson from the Scripps Institution of Oceanography says, is whether "a reef will cross the threshold and lose calcium carbonate. And if so, how fast? " What they did: Rebecca Albright from the California Academy of Sciences and her colleagues used carbon dioxide to lower the pH of seawater. 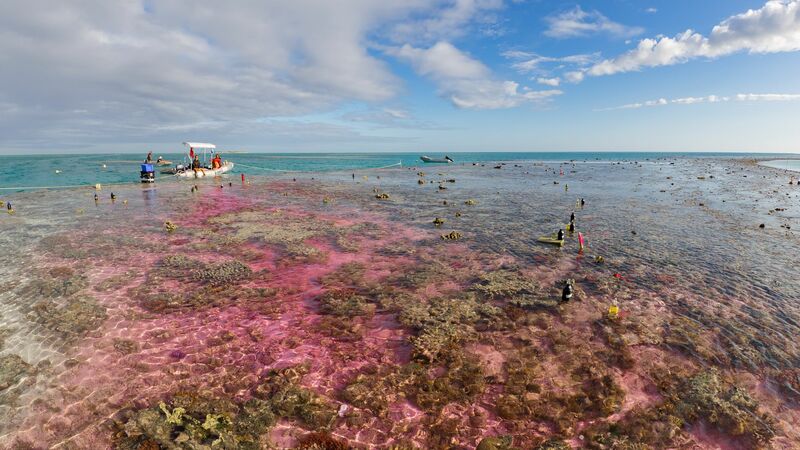 Then, for thirty days, they pumped it over a patch of a shallow coral reef in the southern Great Barrier Reef in order to mimic ocean acidification conditions scientists think could occur in the coming decades. What they found: "We simulated conditions under a business-as-usual scenario that will probably happen in 2050–2060. And, we saw a 34% reduction in the growth rate of the reef," Albright says. That's a stronger response than what is seen in laboratory experiments — typically done on single species. Study limitations: The current study took place over a relatively short amount of time (30 days versus decades) and in a shallow reef, with species and environmental factors that likely differ from deeper reefs or other sites. "What is the capacity of systems to acclimatize or adapt to changing conditions through time? Every laboratory study is done over a faster time scale. Do organisms have capacity to cope over time? Or, with prolonged exposure, does the reef wear down over time?" "We need more of these studies to enhance our understanding of what the impact will be at ecologically meaningful scales," Albright adds.